There is something to be said for a hearty pasta meal, especially when its as rich and creamy as this Crab Alfredo recipe. We’ve made our fair share of pasta, from Spicy Sausage Pasta Bakes to freezer-cooking friendly Baked Spaghetti. Our Goulash recipe is to die for, and our Italian Pasta Salad–it’s beyond reproach. If you’ve made a homemade Alfredo sauce, you know it is a little bit indulgent in its rich flavor. This is one of those meals that needs to be savored, so be sure to enjoy each and every fabulous bite of this delicious recipe. You better believe this meal is one to be savored. It’s bite after bite of pure rich decadence. One bit of advice, if you are making this recipe with crab legs, be sure to have some good seafood crackers on hand. They make the job of extracting crab meat SO much easier…and it is totally worth it to buy fresh crab meat when you can because the taste is amazing. However, if fresh isn’t available buying frozen crab meat is good as well. Crab Alfredo pasta is an fabulously perfect for either a fancier dinner or a weeknight meal at home. Making Alfredo sauce from scratch is much easier than you might think. The first time we made Alfredo sauce, it was a huge surprise how simple it was to pull together. What can be better than butter, cream, and fresh crab legs? Nothing. Well, not if you use this combination of ingredients. Want the secret to super creamy Alfredo sauce? It’s using great ingredients, and the real thing. Which is exactly what makes this recipe so special. There is plenty of the “real thing” in this recipe and your family is sure to enjoy it. Don’t skimp here, it’s OK it’s a special treat. Enjoy. Click Here to get more top-rated restaurant copy cat recipes.. 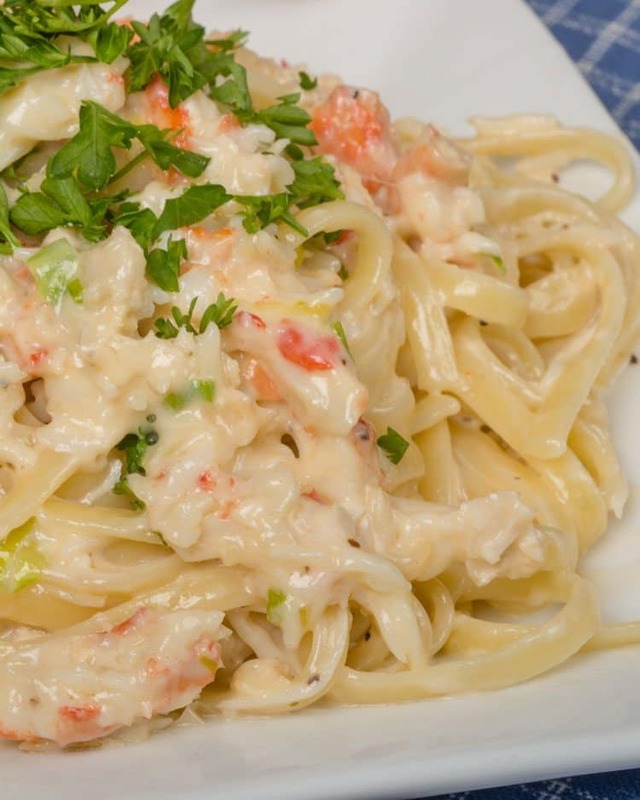 Enjoy this lighter version of Crab Alfredo. We’ve made it with heavy whipping cream before too, which is equally delicious, but has a bit more fat. And don’t forget to serve up some bread on the side. 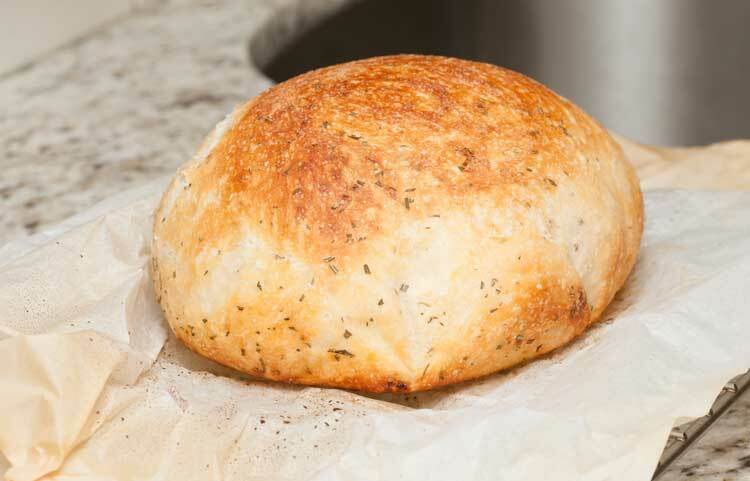 Personally, we can’t get enough of this delicious Copycat Rosemary Bread! If you’re looking for the perfect bread to accompany just about any classy Italian fare of comfort food favorite, the Copycat Rosemary Bread loaf is a favorite of many of our readers. When it comes to making home style Italian food, this is about as good as it gets. Now, you could always go all out and make your noodles from scratch as well, but this recipe is delicious and a manageable meal that you can serve up any night of the week. 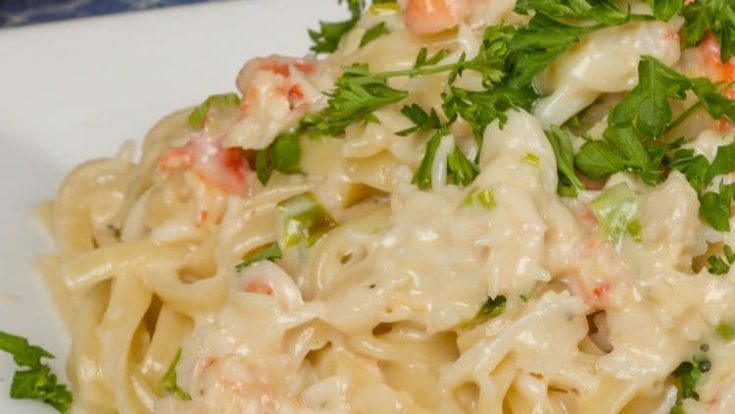 If you like seafood and pasta, you can’t go wrong with our Copycat Red Lobster Crab Alfredo. It is absolutely delicious and saves you a few calories over some of the recipes that call for heavy whipping cream instead of half & half. Pure deliciousness on a plate! Copycat Red Lobster Crab Alfredo. 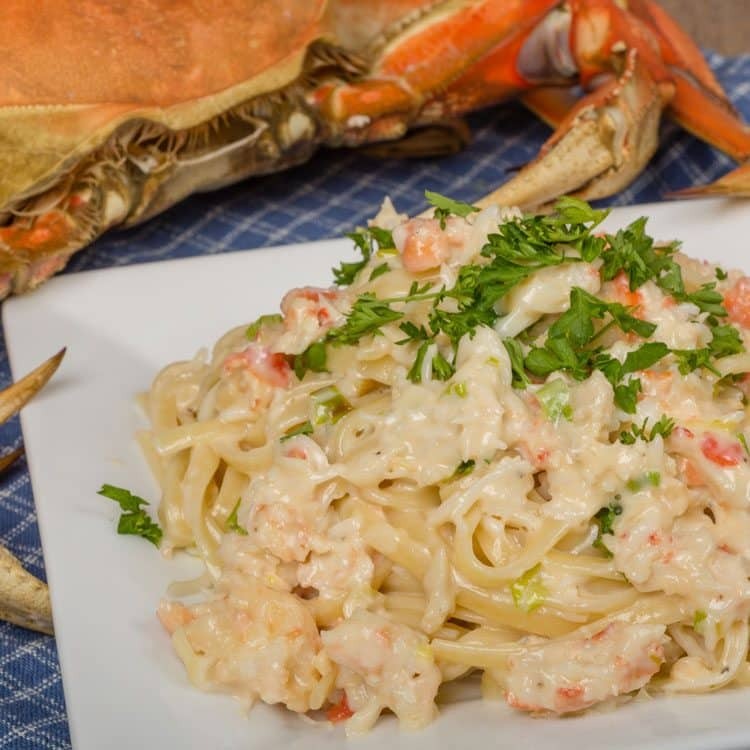 You will love this classic Alfredo recipe with pieces of crab meat. Add the cream cheese once butter is melted. Add the heavy cream and the Parmesan cheese once the cream cheese is softened. Add garlic powder to the mix and stir well. Set burner to low and simmer concoction for 15 to 20 minutes. In a large stock pot or pan, bring water to boil. Add the crab legs and cook until done. Meanwhile, cook the pasta according to package directions until just done, or al dente. Remove from pot and crack open the crab legs. Blot with paper towel to get the excess water off. Place the cooked meat on top of the Alfredo sauce on top of your pasta. Can I use imitation crab? Sure! That would work nicely. Will be tryn dis one. . . ! But I’m using green onions as a additive to the sauce as well as some tony’s seasoning . . . ! I cooked this tonight and it is awesome! I would have never thought about putting cream cheese in it but it gave it a better flavor then I have made before. I made mine with real crab, added about a tsp more of cream cheese (just for a little more creamy texture, about 2 extra shakes more of parm cheese, grated garlic (omit powder garlic), and pepper. The base of of the sauce is so good I will be making again just by iteself! Thanks!!! YUM! Love that you used real crab. That sounds so good. Concerned: ingredients say half and half and the body of the recipe says use heavy cream. Hi Jacqui, Thanks for pointing this out. I’ll correct that! You can use either one with fabulous results. Heavy cream will be a little thicker and heavier…not to mention a few more calories. Half and half is a perfect alternative if you want to cut out some of the calories. I just made this and used whole milk and a little more cream cheese, and added fresh parsley… yumm!! It’s Dungeness Crab season in the Pacific Northwest. This will be on the dinner table TONIGHT!!!!!! Made this recipe tonight . Had imitation crab meat used light cream instead it was magnificent! Yummy!!! My kids loved it! We also added and shrimp it was amazing! I just made this recipe and it’s even better than the restaurants. Thanks for this delectable recipe.